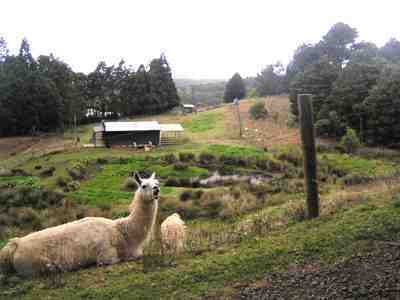 After visiting the Chans we visited Penny King at Karma Llamas at Waitakere which is close to Auckland . . .
Penny and her musician husband Paul Symons live in a lovely private valley. This photo is taken at the top of their driveway showing the male’s pastures. The roof of the house is just visible through the trees and the females had pastures down the hill from there. 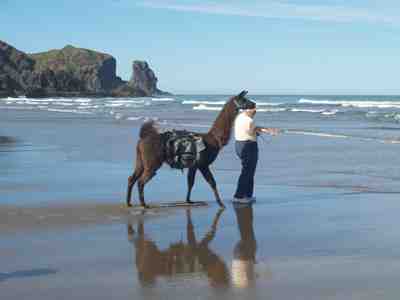 Penny takes customers out on llama hikes so we loaded up two of her llamas, Max and Lawson, into her van and drove to Bethell’s Beach looking out on the Tasman Sea. We had visited Geoff Clarke and Jenny Arscott at their farm, Willows Reach in Kumeu, earlier and they joined us with two of their llamas. 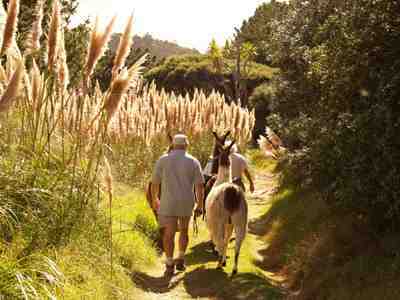 The road to the beach had beautiful pampas grass along the way. 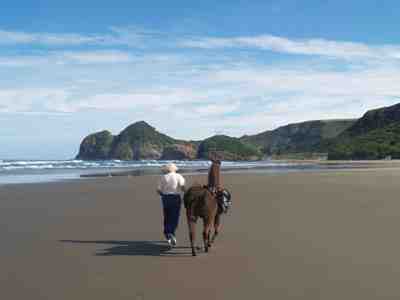 Bethell’s Beach was even more beautiful than Penny had indicated. 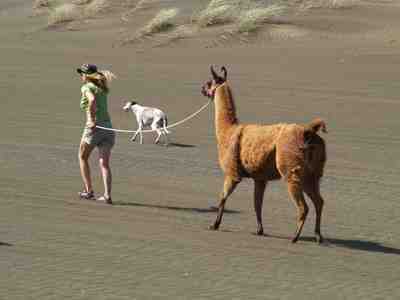 Jane walked Max down to the shore and got their feet wet. 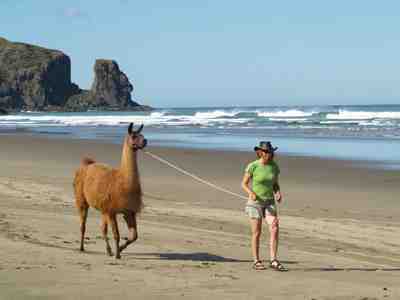 Lawson had never even been in the van before, but he enjoyed his first trip to the beach with Penny. 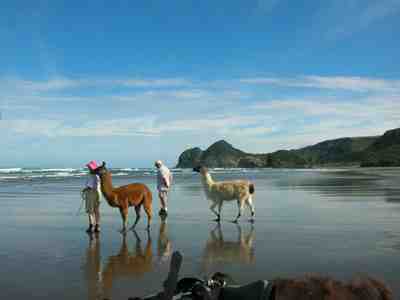 This was also the first trip to the beach for Geoff and Jenny’s llamas and the four of them had a wonderful day. Llamas like to look around and make certain that everything is safe. These two are alertly checking out the surf, which is something they have never seen before. I think that Jane liked hiking on the beach because there were no hills to climb. 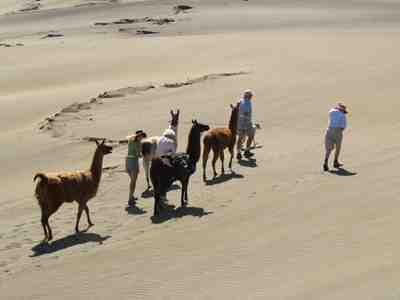 We took a detour on our way back to the vehicles through an area of huge sand dunes. It was like hiking though a desert. Penny and Lawson going into the wind.